Picture yourself with a warm cup of coffee out on the porch of a log cabin overlooking a beautiful lake at the base of a majestic mountain. This is Adirondack living. When you incorporate Adirondack decor style aspects into your living space, what you end up with is a space that is warm and inviting and centered on bringing the beauty of nature indoors. People who frequently visit the Adirondacks as well as those who call it home, love to be outdoors. They enjoy outdoor activities such as boating, fishing, hunting, and hiking. Adirondack life is about being at one with nature and surrounding yourself with everything that reminds you of the artistry that most certainly went into creating such breathtaking surroundings. It is this love for nature and the outdoors that has made Adirondack décor so popular. The natural, homey feel it exudes entices friends and family to sit around a crackling fire and spend some much needed time relaxing and letting their cares melt away. 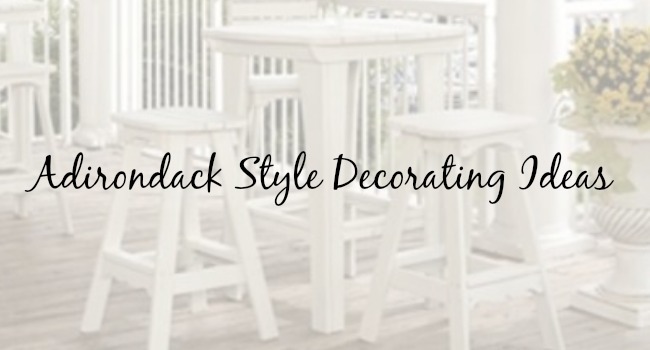 These Adirondack style decorating ideas will help you get a better feel for the style in general. Incorporate them into any room to create a space that everyone will enjoy. This first piece comes to us from Homedit.com. We all know that tables are many times at the center of an inviting space where people will be gathering. 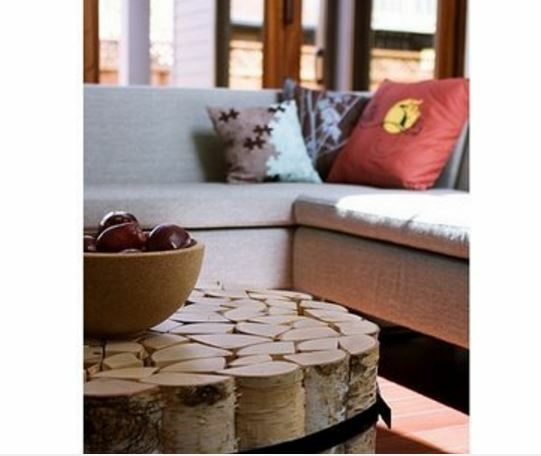 This log table can be made to match any existing décor. You simply cut large logs from any type of wood, ensuring they are exactly the same length. Arrange the logs into the shape and size you would like your finished table to be, and then glue the logs together. Finish by wrapping a piece of rustic-looking rope or even a wide ribbon around the logs. We love this idea because you decide how big or small the table is depending on the amount of space you have. Nothing says ‘home’ like a hand-crafted piece of furniture. Wood is essential when trying to incorporate the aspects of Adirondack living into your home. 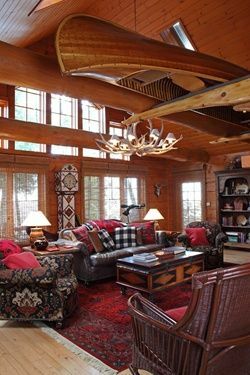 This unique living room from Cabin Life Magazine uses the beauty of wood in a number of different ways. We love the beaming on the ceiling as well as the addition of the upside down canoe. The rustic antler chandelier adds a special touch to the lighting in the space. The addition of the colorful pillows breaks up the darkness of the wood in the room. The book case can be used to display trinkets and knick-knacks and maybe a few of the classics for some light reading. 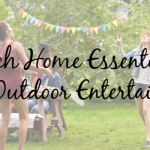 When styling your home, you simply cannot forget the patio or deck areas. 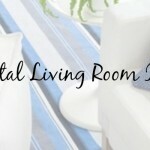 These areas are extensions of your home and should be in keeping with the same theme or décor. 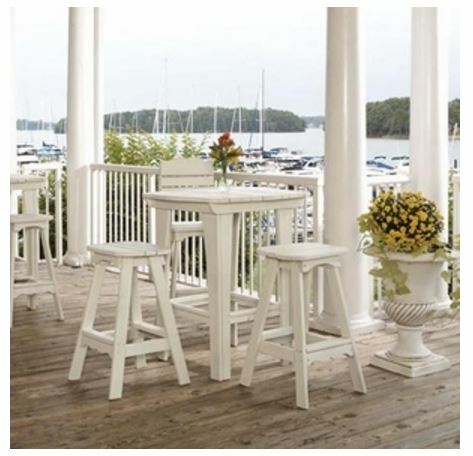 We found these amazing Adirondack outdoor furniture and decor on our Cottage & Bungalow website. These sets are perfect for entertaining or just sitting outside with a warm cup of tea reading the newspaper. Choose a number of benches uniquely arranged into a lovely sitting area for a more intimate setting, or set up a number of our bar tables and chairs along the deck for more of a party feel. You don’t have to be a mountaineer to love the Adirondack style of decorating. 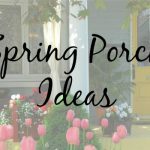 These ideas will help you incorporate this popular style into your home and outdoor areas in no time at all.